Delicious falafel, without the deep-fry. These flavorful oven-baked falafel are filled with fresh herbs and spices. Protein-packed & amazingly versatile: serve on a mezze plate, tuck into pitas or crumble on a salad. Vegan & Gluten Free. 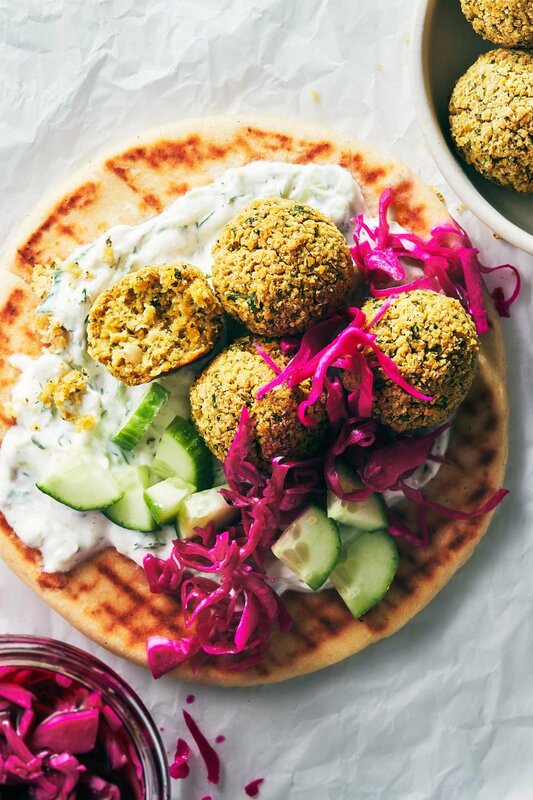 Whenever we see falafel on the menu, our heart skips a beat. It makes us think of the herb-packed falafel pitas we feasted on in Greece, the mountains of falafel they serve up at our favorite Lebanese restaurant, and frankly, just how good it’ll taste when dunked in tzatziki. For non-meat-eating folks like us, these protein-packed bites of heaven hold their own far more than a “side of vegetables” ever could. So if you put falafel on the menu, chances are, we’re going to order it. And if it’s amazing, you might see us again tomorrow. Restaurants and food trucks usually deep fry their falafel. It’s quick, convenient, and let’s be honest: everyone likes fried food. But back at home, we find the frying step totally unnecessary. Instead, you can use your oven to make delicious homemade baked falafel. Oven-baked falafel is not only healthier for you, but it also means you can avoid making your house smell like a greasy food truck. Getting to eat lots of guilt-free falafel, without the oily mess? Sounds like a win-win to us. The trick to a good falafel ball is to start with dry chickpeas (not canned). You’ll want to soak the chickpeas in water, so they can plump up overnight. Then, once the dried chickpeas are rehydrated, they’ll be perfect for turning into fluffy falafel. Arguably, the hardest part of this recipe is budgeting time for an overnight soak. But we promise you, it really isn’t all that bad. The rest of the recipe comes together quite quickly. Throw the spices and fresh herbs in the food processor, and pulse until finely minced. To make scooping and shaping a breeze, we like to use our retractable ice cream scoop to divvy up the dough. But you could just as easily use a regular spoon and eyeball it. 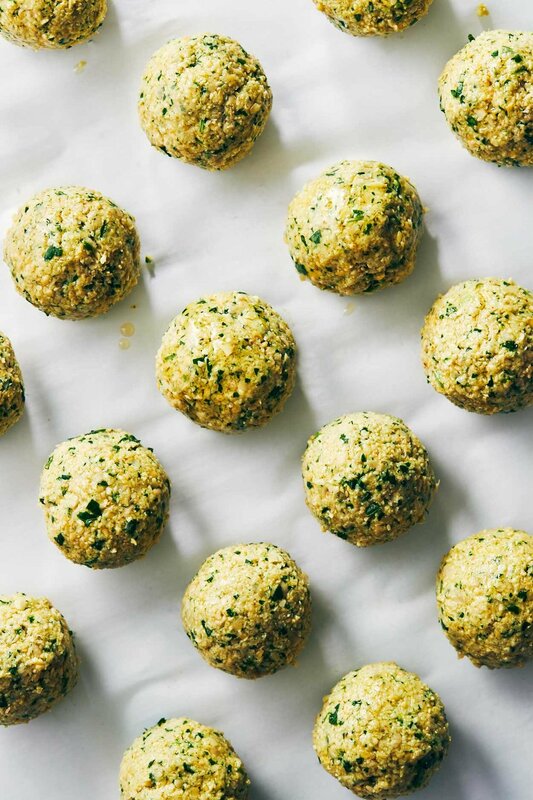 These falafel balls are jam-packed with fresh herbs and spices to make them super flavorful, even without the oil bath. For any cilantro-haters out there, we’ve got your back. Admittedly, we love cilantro - but Anguel’s dad does not - so this version skips it altogether. Flat leaf parsley is truly all you need, as we’ve learned after much testing. And after making this recipe many times over, we appreciate how we can serve it to friends without doing the mental check of whether anyone in the crowd is not on team cilantro. When it comes to parsley, flat-leaf (Italian) wins over the curly kind. Flat-leaf has more robust flavor. In fact, nine times out of ten, we buy it over curly because flavor-wise it’s more bang for your buck. 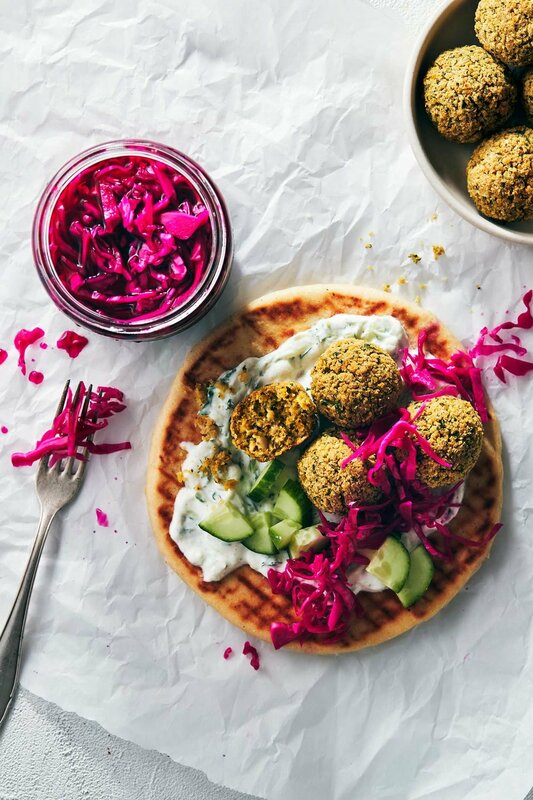 Since falafel can be eaten hot or cold, it makes for especially convenient dinners, lunches, snacks...in other words, they’re a meal-prepper’s secret weapon. 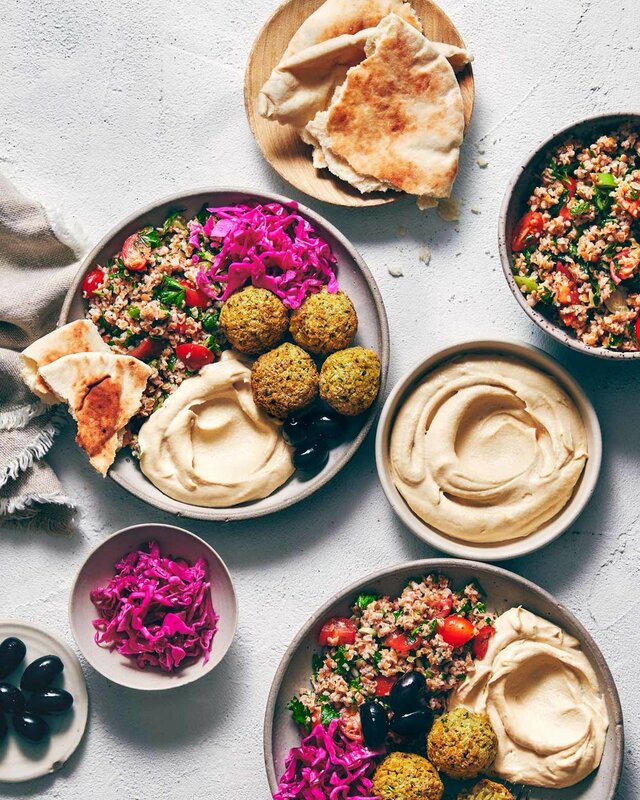 We like to serve falafel on mezze-style platters, tuck them into a fluffy pita, crumble them over top salads, or pack them in clean-out-the-fridge bowls with whatever smattering of things we can find in our fridge at the end of the week. Falafel is delicious with tzatziki sauce (vegan or yogurt-based). Bonus points if you make some Pickled Red Cabbage to serve alongside! The night before, place dried chickpeas in a large bowl (or pot) filled with water. The dried beans will triple in volume, so ensure you add plenty of water to accommodate. Cover and let soak at room temperature for approximately 18 hours. Strain and rinse after soaking. The next day, preheat oven to 425°F. Line a baking sheet with parchment paper. Add rehydrated chickpeas, garlic, yellow onion, parsley, lemon juice, cumin, coriander, salt, lemon zest, black pepper, cayenne and 1 tablespoon of neutral oil to the food processor. Pulse, stopping to scrape down the sides as needed, until the chickpeas are finely minced and the batter is evenly mixed. The batter should loosely hold when squeezed together with your fingers. If not, process a bit more. Scoop out the batter and use your hands to press and shape the dough into 24 balls. The batter will be slightly tacky, but if it’s too hard to handle, place mixture in the fridge for 10-15 minutes to firm up before scooping and shaping. Spread falafel balls out on baking sheet. Put remaining 1 tablespoon + 1 teaspoon neutral oil into a small bowl. Use a pastry brush to brush oil on the falafel. Bake for 20-25 minutes until firm and slightly golden brown on the outside. -*Grapeseed oil is our neutral oil of choice, but other neutral tasting vegetable oils, such as canola or sunflower oil will work well. You could even use olive oil.